Often for Sunday night dinner, we will tackle a more elaborate dish or something that requires a longer cooking time. 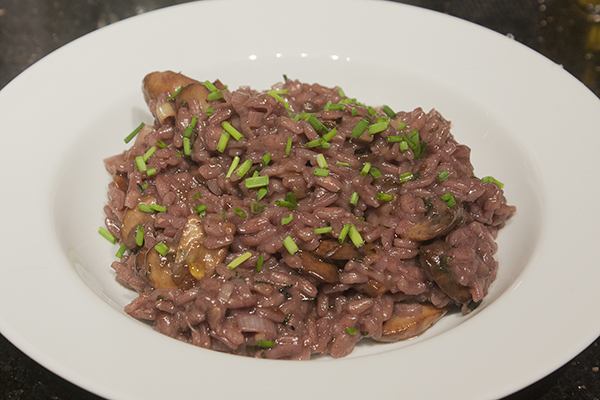 Last Sunday (March 15), Kim made Red Wine and Mushroom Risotto from the “The Newlywed’s Kitchen” cookbook. Kim shares how it went. I have to say I was a bit intimidated to make risotto (All that stirring! What if the rice didn’t absorb the liquid? ), but I am really glad I have this recipe a try. I started by doing all the prep in advance thinking that I would be able to do little else during the stirring phase. While this was mostly true, I think I could have handled sautéing the mushrooms and stirring together. I started first by doing the prep for the mushrooms: dicing the shallots, cleaning and slicing the mushrooms (I used baby Portobello mushrooms), chopping parsley and stripping thyme leaves from their stems. I then turned to doing the other prep work: measuring the wine (2012 Tre Vigne Barbera D’Asti recommended by Wines by the Flask) and vegetable stock. (The recipe suggested chicken stock but since we gave up meat and poultry for the 40 days before Easter, I decided to make this substitution.) I also measured out the rice, grated the cheese, and finely sliced the leek. My final prep was making a quick lemon-Dijon vinaigrette for a simple green salad. I started the cooking portion of the recipe with the mushroom. I followed the instructions of melting butter and olive oil together and then sautéing the shallots until almost caramelized–mine took about three minutes. I then proceeded to add the mushrooms, thyme, and parsley and sautéed for about four minutes. I did not have tamari (I had looked diligently for it in several local places for another recipe a few months back and did not have time then or now to search at an Asian market), so I decided to substitute balsamic vinegar, which turned out to be a great choice. As the mushrooms were sautéing, I began getting the wine/stock mixture going. When the mushrooms were done and the wine/stock mixture was nice and hot, I turned my attention to sautéing the leeks in butter (I used a Dutch oven). I then added the rice to the pot and began coating it in the butter/leek mixture. Now things were really starting to smell great! It was now time for the step I was the most nervous about–adding the wine/stock and stirring the rice until the liquid is absorbed and only then adding more liquid. I found this step really to be pretty straightforward– it was clear when the liquid was absorbed by the rice and it was quite satisfying to see the grains of rice become plumper and plumper and turn creamy and a beautiful reddish-purple as they absorbed the liquid. This step took patience, but it was well worth it; the methodical nature of it all was sort of soothing. I dressed the salad and plated the risotto adding some finishing touches of freshly snipped chives and a drizzle of truffle oil. The risotto was rich and creamy and extremely flavorful. The mushrooms of course gave a hearty, earthy meatiness to the dish and the wine (both in and paired with the risotto) gave it a nice tanginess, plus and the acidity cut thought the creaminess nicely. The chives and the truffle oil were nice touch–I think I could have even added at bit more truffle oil to give it an even richer flavor. We both look forward to enjoying this again and I will definitely no longer be intimidated by risotto recipes!